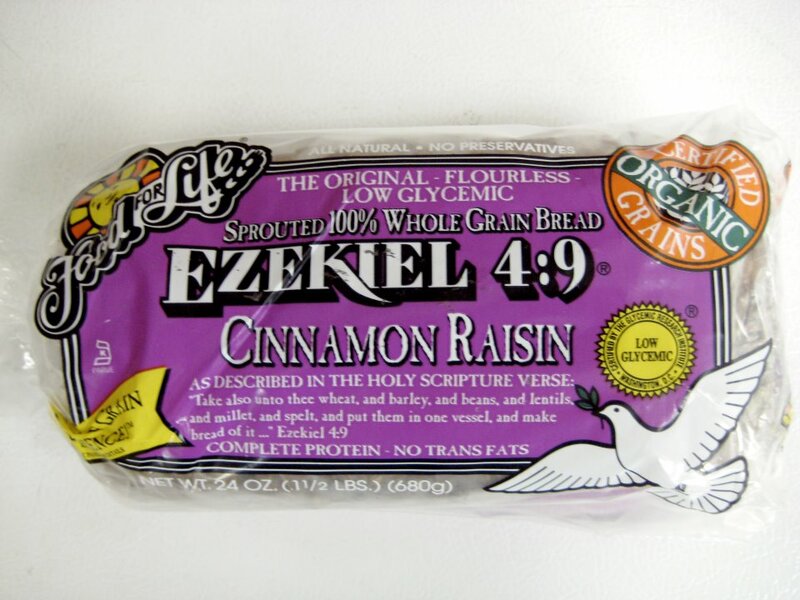 Why is Ezekiel Bread Good for You? 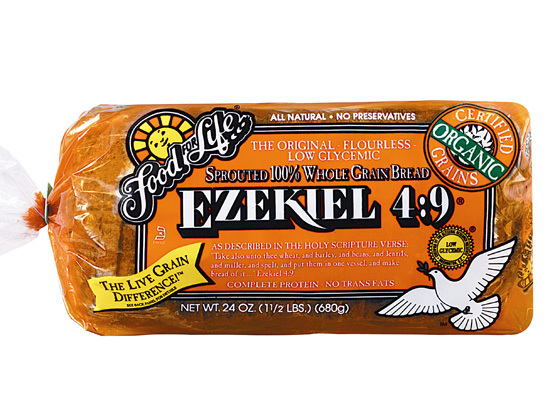 Ezekial bread is made from sprouted grains instead of flour. When the grains are sprouted and combined it creates a protein that closely parallels the protein found in milk and eggs. Ezekial bread digests much more easily than wheat breads, and wheat bread contains gluten which turns to a gel like substance when digested. Also, many wheat breads have additives and preservatives to help it last longer on the shelf. 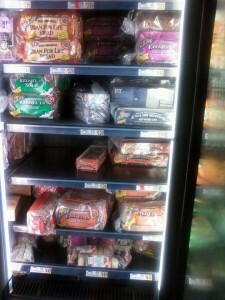 You can find Ezekial Bread in the frozen section of your grocery store, usually there is a small area of organic or gluten free stuff in the frozen section. 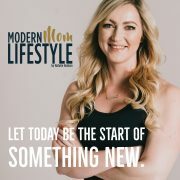 I like the Food for Life brand because they allow you to request coupons from their website once a month! There are no preservatives in Ezekial bread, so unless you can eat the loaf within a few days, you will want to keep it frozen. I usually keep a few slices in a Ziploc bag in my fridge to use for sandwiches and toast, but I also have found that it tastes great to put the frozen bread directly in the toaster when making toast. If you have kids who are picky eaters try giving them the Food for Life brand cinnamon raisin bread! I toast one slice for my two-year old and then rip it into bite size pieces and he usually eats the whole slice with some grapes and Greek yogurt or turkey bacon for breakfast. 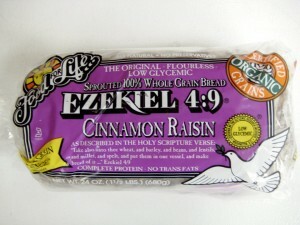 I eat the 4:9 Ezekial bread on a more regular basis and will use the cinnamon raisin Ezekial bread as a treat. The cinnamon raisin has 5g of sugar per slice (because of the raisins), and the regular bread only has 2g of sugar per slice. If you go to their website you can request coupons for Food for Life products once a month. I love the grocery store Wegman’s!! Look at all these awesome Ezekial bread options! They have English Muffins, hamburger buns, sesame bread, low sodium bread, sprouted grain bread, cinnamon raisin bread, tortillas,etc. Most stores only have one or two varieties. I wish this grocery store was nationwide for my friends who aren’t on the East coast. They have a ton of organic options and their prices are just as competitive as all other stores, not super high like Whole Foods. 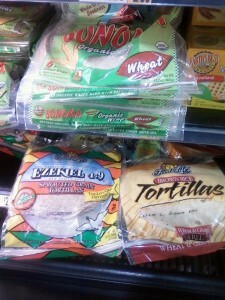 These are the tortillas (the ones on the bottom shelf) that I use when I make soft tacos (I usually use my salsa chicken recipe).You can find this in the frozen section of your grocery store, usually there is a small area of organic or gluten free stuff in the frozen section. 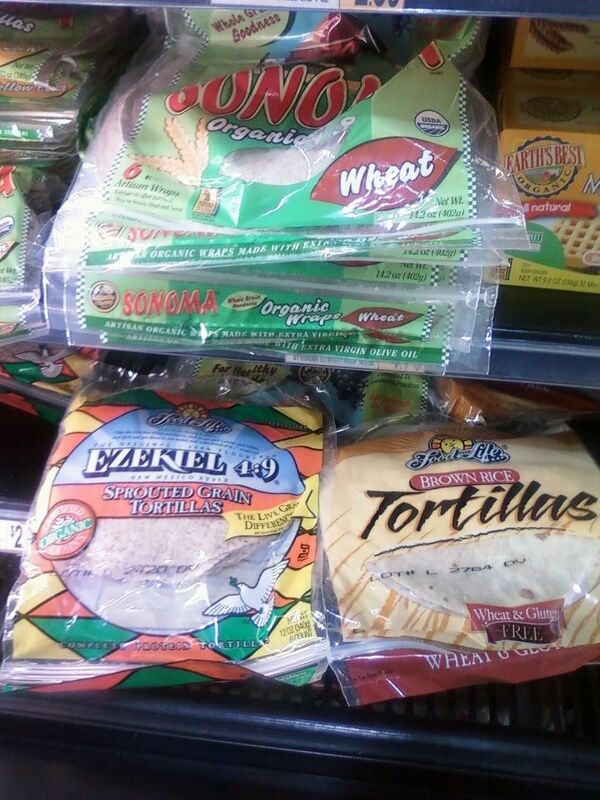 It is usually easier for me to find the rice tortillas than the sprouted grain ones. I keep mine in the freezer when I get home and just defrost them when I use them. There are no preservatives in these tortillas, so unless you can eat them really fast, you will want to keep them frozen. I make soft tacos for lunch all the time. It is a staple in my diet 🙂 I usually use one of these tortillas, shredded salsa chicken, 1 Tbsp greek yogurt (feels like sour cream to me), handful of spinach, lime juice on top, salsa, (you could also add fresh cilantro, diced tomatoes, etc). 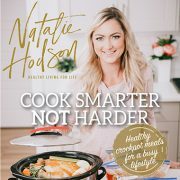 If I am on the go I like to tear the tortillas into bite size pieces and turn everything into a bowl and put it in a tupperware container in my cooler. 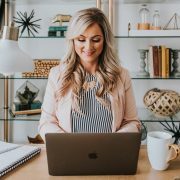 How do you request the coupons? the label on the bread says 0 sugars ?, but you say 2 per slice ? I have just started eating this bread as I am wheat intolerant and find I can manage this if I eat it in moderation! My question is the expiry date on the bag, is that a frozen best before date or am I safe to keep it in the fridge that long? It seems like a long time for a product with no preservatives. I’m pretty sure the reason you suggest to keep it frozen, unless you’re going to eat the entire loaf fast, is because it will go bad (no preservatives). I never thought about that, so I’ve always kept it in the fridge. It usually takes me about 2 weeks to go through a loaf, but I haven’t noticed any problems with the bread spoiling. Could it still be “bad” even though I don’t see anything wrong with it? My daughter eats it too, so I want to make sure I”m not doing something unsafe.